This year our family decided to get a real Christmas tree because the lights on our fake one burnt out. For this reason, we went down to a tree lot at the bottom of the hill called Aunt Leah’s Trees. After looking at many trees on the lot, we ended up with a plump, Fraser Fir tree. Best of all, proceeds from the sale of the tree help prevent children in foster care from becoming homeless and mothers in need from losing custody of their children. 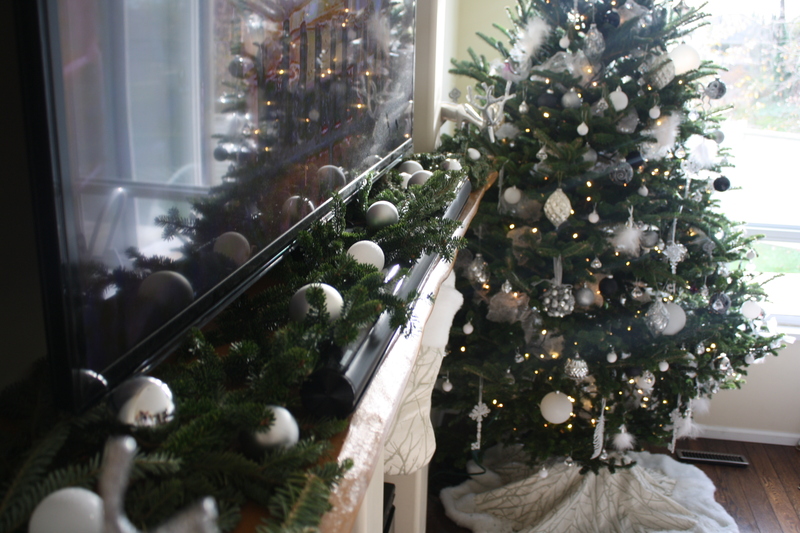 The smell of Christmas entered the home, as we dragged the tree to the corner of the family room. Having a real tree in the house is so nice to look at! It feels like a giant piece of the forest sitting in our living room and the smell brings back so many childhood Christmas memories. The last few years I’ve let the kids ‘help’ me decorate the Christmas tree. In other words, I pretty much told them where to place things. Last year the girls said the house looked like a show home and it didn’t look like real Christmas. Needless to say, I decided the girls were going to decorate the tree this year without my help. We pulled out the ornaments from the basement, and the girls hung the ornaments where they wanted. I’m not going to lie, I was so tempted to ‘tell’ the girls where to put things, but I held my breath and watched as they danced around the living room, picking up ornaments, and stacking them on the branches. Justin Beiber Christmas played in the background, while our two youngest daughters were completely immersed in placing ornaments and mesh everywhere they could. Our eldest daughter only hung a few, she was more concerned with playing the best Christmas songs for us. I must admit, we don’t own red, green, or bright ornaments but just because I was letting the girls decorate didn’t mean I was going to go out and buy all new decorations. We simply ended up using what we have, and the girls were completely happy just hanging. I suggested whatever they make at school they should hang right at the front of the tree! I know however I’m not alone in this obsessive, Christmas decorating, control freak thing. At least, I hope I’m not! Letting the kids decorate the tree this year, was basically the same as facing a big fat FEAR. I’m still trying to recover from my obsessive Christmas disorder and this was the greatest test. My inner Martha always comes out at Christmas and yes, I cringed. I cried a little on the inside when I saw a stack of the same ornaments on the same branch, but the result was better than I had expected. And, isn’t this usually the case when we face our fears no matter how big or small, or in this case, ridiculous! We usually realize it wasn’t so bad after all. Letting go of the need to control can be tricky to do, bit when we become aware of our need to control, it becomes easier to let it go. Needless to say, there are far more important things to think about during the holiday season, like the memories we make with our loved ones or the fact that some don’t even have a Christmas tree at all. I’m so grateful the proceeds from this years tree are going to Aunt Leahs trees. Side note: I have a feeling she has an inner Martha too, let’s hope she doesn’t suffer from O.C.D (Obsessive Christmas Disorder) for her future husband and kids sake! And they did it, all on their own. I swear I haven’t moved a thing! I must say, my inner Martha’s quite impressed!